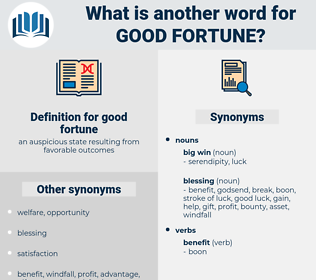 What is another word for good fortune? Damnification, curse, hindrance, harm, blight, condemnation, bad luck, ill will, misfortune, loss, hurt, bad fortune, damnation, disadvantage, disapproval, injury. evil, wickedness, sin, punishment, immorality. discontent, failure, unhappiness, trouble, dissatisfaction, pain, misery, disappointment, depression, need, want, indecision, sadness, sorrow, woe, gloom, displeasure, melancholy, penalty. 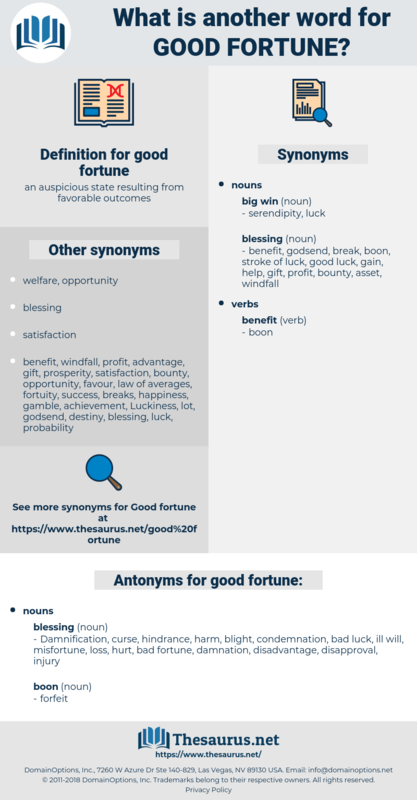 destiny, fortune, circumstances, portion, fate, luck, lot.